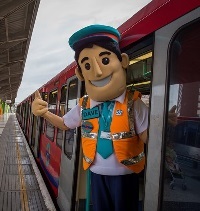 The exclusive DLR Discovery train is running every Saturday and Sunday until 9 September. Put together by Transport for London (TfL) and operator KeolisAmey Docklands (KAD), it’s billed as an opportunity to join a new and one-of-a-kind experience linking two of London’s best-known destinations, Tower Gateway and the iconic sailing ship Cutty Sark at Greenwich. The train is a non-stopping service on a route not normally served by the DLR. Although the tours end soon, there’s nothing to stop those interested hopping on the system after that date and checking out the itinerary for themselves. The only difference will be the official ‘Discovery’ tours have professional guides on board to give an insight into the history of East London. The trip also includes a 30min guided walking tour of Greenwich, but in both cases it’s possible to arm yourself with a guidebook or two beforehand and follow that. It’s just not as personal. 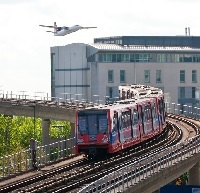 As DLR’s introduction to the tours says, the Docklands area of east London is particularly well known for its vibrant neighbourhoods and rich cultural heritage, with the railway a unique way to see how this part of the capital has grown and developed over the past 100 years. Other cities have carried out similar transformations of their former industrial landscapes, but few on the scale of Docklands and none with the London back-story encompassing the spoils of Empire, Victorian opium dens, Jack the Ripper, the Blitz and its own airport minutes from one of the world’s most important business and financial centres. Judging by the numbers on the tour sampled by BTN, a Saturday 11:00 departure, TfL has uncovered a winner, with every chance the idea will be repeated. We were among 47 fellow travellers, all apparently enthusiastic despite some overcrowding on the train and according to comments once we reached Greenwich happy with the organisation. There was some confusion at the end of the walk around Greenwich, with participants simply left to their own devices, a wrinkle that needs to be ironed out. The fact the train is non-stop means our guide was hard put to get all the information out before we had moved on to the next item of interest but, again, a guidebook as a back-up would solve that. To be fair, there is a lot to fit in. Every DLR station has a story, from Tower Gateway itself through West India Quay, Crossharbour, Shadwell and its memories of the Battle of Cable Street, to Mudchute, Island Gardens and the World Heritage Centre of Greenwich. Other highlights among many include the historic Billingsgate Fish Market and Limehouse Basin and its network of navigable canals. For aviation fans, Heron Quays is where Harry Gee landed a de Havilland Canada Dash 7 to show the feasibilty of a short take-off and landing (STOL) facility, forerunner of London City Airport. The whole thing is set against the backdrop of the futuristic skyline of the financial and cultural district at Canary Wharf and the bang-up-to-date Crossrail Place and Roof Garden above the newly-built Elizabeth Line station. 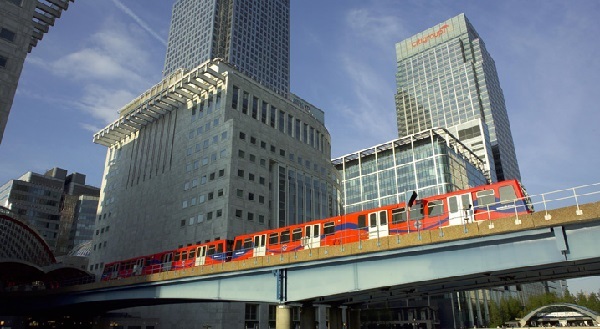 The DLR opened in 1987 and helped to kick-start the regeneration of Docklands, playing an integral role in the transformation of the area while supporting the creation of thousands of jobs and homes. The network began with 11 single-carriage trains that served 15 stations and has since been extended six times to help to meet east London’s growing population. Thirty years on from its opening, the growth and redevelopment of the Docklands continues, with transport links out to keep pace to enable further development of the area. For example, DLR customers will benefit from new trains in 2022, helping to boost capacity on the network by 30%. The new trains will feature onboard real-time information, air-conditioning and mobile device charging points for the first time. The weekend Discovery Tour trains depart on the hour every hour from 10:00, with the last leaving Tower Gateway at 17:00. Tickets cost £8 per adult and £4 per child and include a return journey on the DLR.